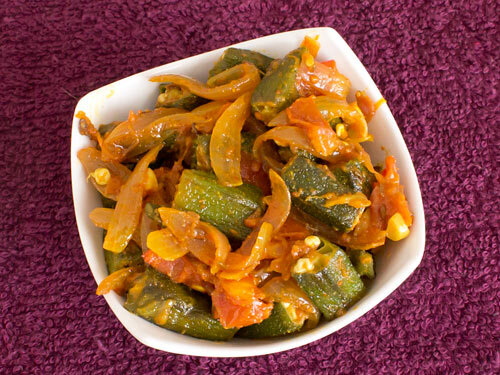 It is a spicy Indian stir-fried okra and onion curry, a delectable veggie marriage made in heaven. The above normal amount of sliced onion, generous use of curry spices and tomatoes in this easy bhindi do pyaza recipe makes it one of the best bhindi curries. If you are an onion lover, then this is a must try recipe for you. Try this today and see how extra amount of sautéed onion simply transforms the taste of stir-fried okra. Wash bhindi in water and dry them completely. Cut it into 1-inch long pieces after removing its top and tail. Heat 1½ tablespoons oil in a pan. Add cut bhindi pieces and cook them on medium flame until they turn dark green or for 7-8 minutes. Transfer to a plate. Heat remaining 2 teaspoons oil in same pan. Add cumin seeds and when they begin to crackle, add crushed ginger garlic. Sauté for around 30 seconds. Add onion and green chilli pieces; sauté until onion turns light brown, approx. 1-2 minutes. Add chopped tomatoes and cook for 2-3 minutes. Add red chilli powder, turmeric powder and coriander-cumin powder; mix well. Add cooked bhindi, lemon juice and salt; cook for 2-3 minutes. Turn off the flame and transfer prepared curry to a serving bowl. 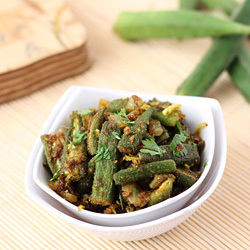 Garnish bhindi do pyaza with coriander leaves and serve hot. Wash and dry bhindi 2-3 hours before cooking. Chop ladies finger into 1/2-inch thick round slices for different look and texture. Serving Ideas: Serve it with steamed rice and chapatti for healthy veg dinner. Aug 10, 2017 by Anthony G.
Will be trying it out. seems to be nice. Tried to copy the recipe for further use... but couldn't do it.... why ?? Response: Ravinder, many websites and people on internet copy and publish the recipes prepared by us without our consent and this affects us badly. Hence we have disabled the copy. We recommend to use Print Recipe functionality provided by us if you need to copy it for personal use.